The growing volume of domestic and international marine trade is expected to drive the global marine freight transportation services industry to an estimated US $411 billion in 2017 with a CAGR of 2.6% over the next five years. The marine freight sector consists of revenues generated from freight transportation by ship, including the sea and inland waterways modes, at domestic and international routes. The marine freight market is a regulated market characterized by high competition with high entry barriers. Sea and inland waterways are sub-segments in which sea is the largest segment of the marine freight market, accounting for 69% of the total market in 2011. Lucintel’s research indicates that the demand of marine freight transportation services is expected to grow in 2012 and beyond, and the total volume of domestic and international marine trade is expected to be more than double over the next 20 years. An improving US economy, a significant surge in various shipments, and a sharp rebound in many end-markets are expected to fuel the future growth of the marine freight market. The threat of terrorism and environmental issues creates an additional element of uncertainty and challenges that forces marine freight companies to implement highly effective security and risk management systems. The increasing demand for containerized cargo and the introduction of new routes or services are likely to change the marine freight market dramatically. The ROW and APAC regions are forecast to witness the highest growth over the next five years. This study provides an overview of the global marine freight transportation services market. The report tracks four segments of the global marine freight transportation services market. 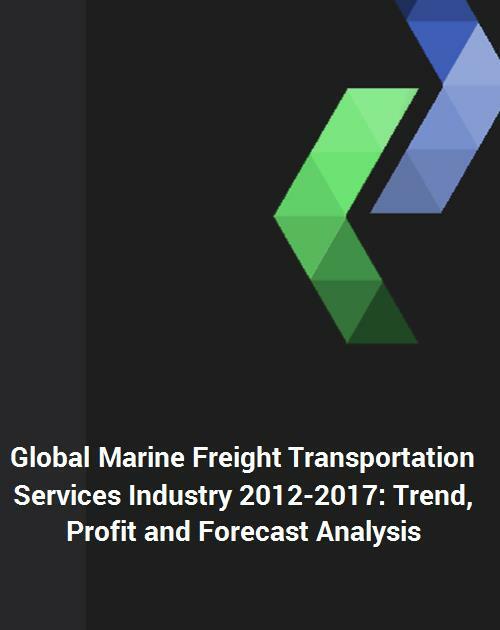 This report studies both domestic and international freight transportation by marine only and does not include passenger transportation. This comprehensive guide from Lucintel provides readers with valuable information and the tools needed to successfully drive critical business decisions with a thorough understanding of the market’s potential. This report will save Lucintel clients hundreds of hours in personal research time on a global market and it offers significant benefits in expanding business opportunities throughout the global marine freight transportation services industry analysis. In a fast-paced ever-changing world, business leaders need every advantage available to them in a timely manner to drive change in the market and to stay ahead of their competition. This report provides business leaders with a keen advantage in this regard by making them aware of emerging trends and demand requirements on an annual basis. This study is intended for material suppliers, parts fabricators, OEMs, investors, executives, and consultants. This multi-client market study from Lucintel is used by small to multi-national Fortune 500 companies and utilized for a variety of reasons as follows.